Update 2/6/2018: We got 5 inches in the area and more on the way this week. Expecting snow each day with another significant system coming through Friday. Remember towns do not want you tearing it up when riding inside their city limits. This is a sure fire way to lose the access. Towns can and do pass ordinances that block your riding. Iowa code does not grant you access to towns. STAY ON THE TRAILS OR STAY HOME! We have had some issues in local towns. Ely – When entering town and going to Odie’s Bar & Grill, please park behind the City Hall Building. They is no trail directly to Odie’s. City residents are not happy with the amount off of trail riding. Shueyville – Please follow the designated trail. 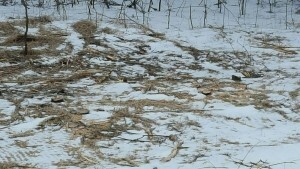 Snowmobilers are trespassing through fields North of Shueyville. Please see photo below. Trail #5 ,east of Polk avenue, NW of Solon.will be impacted. Approximately 1/2 mile of trail #5 east of Polk ave will be narrowed down and limited to the area along the fence line running east/ west. Use caution. Extra signage will hopefully take place Feb 10th. Highway 965 – From Swan Lake Road to Swisher Black top is not marked. Ride with caution. 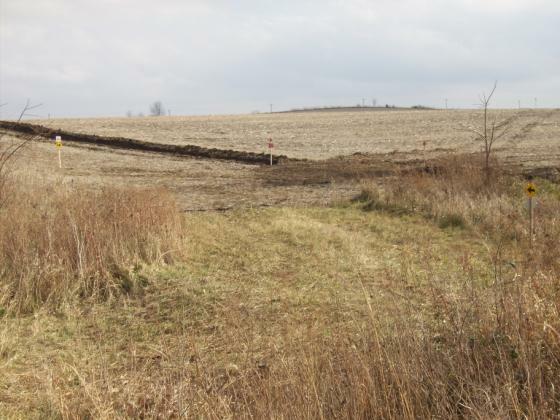 HWY 30 – On the South side of the highway between Jappa Road and Old River Road the stakes are in but is not signed all the way. The north side is signed. Norway to Blairstown – Use Caution – Trail is only marked half way. The last section to Blairstown is not marked. 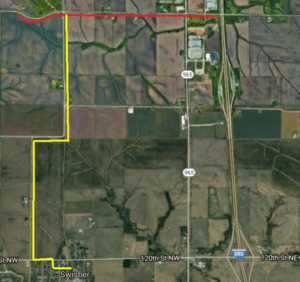 12/17/2016 – Access to Swisher from Walford Road was allowed from the Swisher City Council. Thank you Swisher. We now can access the Black Squirrel Tap and the Kava House. Please ride slowly in town, do not spin your track and obey the signs. 12/10/2016 New reroute for Tiffin due to the city making updates to the main road in town. It is to dangerous to ride along HWY 6 at the main intersection. Please follow the new route. If you need gas or want food you can still get into town. Just be safe. To all our snowmobile friends. I’m putting this out early in hopes it gets past around before the snow storm we could possibly get next Tuesday. The lake in front of Bobbers does not look safe. there is an ice heave from boheme beach going across the lake to our wave break. its at least 2ft tall. Also we have an open spot coming up the boat ramp an another just out side of the wave break. Looking down the lake there appears to be a big open spot on the Lake Mcbide boat ramp area. the trail on Scales Bend Road is marked please use it. Please be safe one tragedy is one to many. 2/4/2015 The trail from North Liberty to Solon is almost impossible to groom due to the silt fences. We will do what we can however this area is going to be rough. 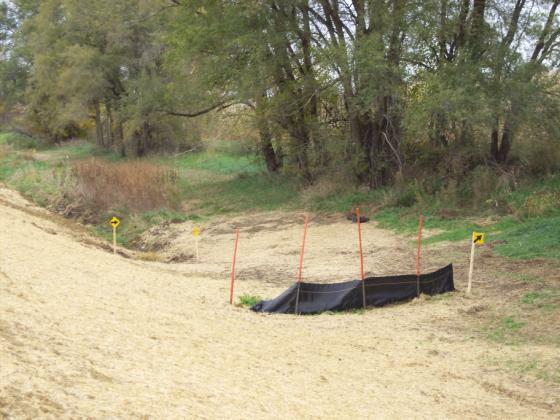 1/9/2015 Trails from North Liberty to Solon and in town in North Liberty along 965 and Dubuque street by Penn Elementary have silt fences. These are marked however make sure you pay attention. The bridges are all in and all trails are open. 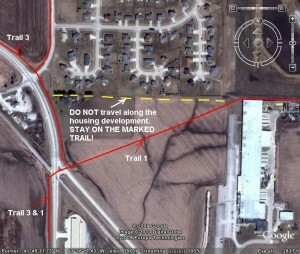 There is a new trail around North Liberty to the west. Coming up from Tiffin keep going north instead of turning east towards town (this is well marked) . New maps are printed and we are working on distributing them now. Website will be updated shortly. Trails have all been marked (12/20/13) and are ready. The trail to Bobbers from NL has not been marked. There are a few signs still up from prior years on this trail. The trail south to Windham is marked however some of the fields have been plowed so watch out for rough areas. We had some signs stolen around Newhall and Watkins so beware. 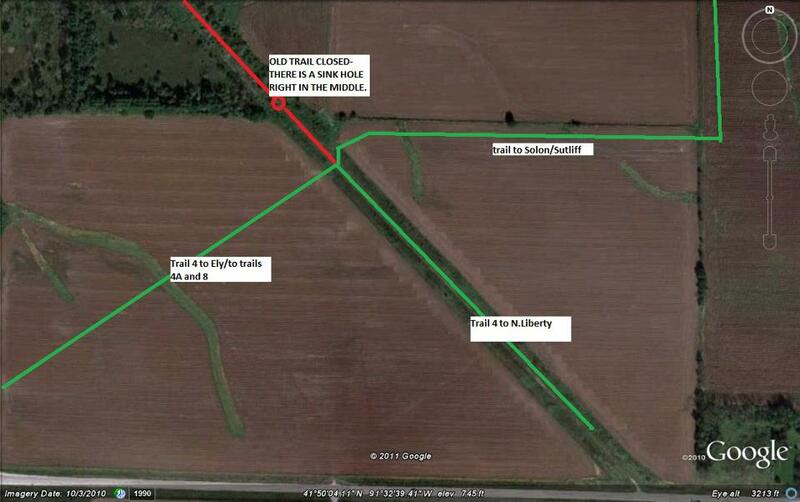 Trail changes (12/27/2012) – note that the trails no longer go through Western. This reroute is well marked. 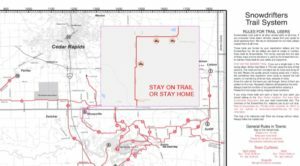 Trail warning – …The COE will begin the Lake Draw down starting Thursday 2/9/2012. Therefore there will be voids under the ice. Please beware. – Maintain current pool of 685 through October 24. – Begin slow raise starting October 25 to elevation 686.4 by November 5. – Maintain this level until December 30 if possible due to the extended goose season. This may not be possible due to the freeze-up conditions will dictate this final level. – Maintain normal summer pool of elevation 836 through October 14. – Begin slow raise starting October 15 so the fall pool of 837.5 is reached by October 22. – Maintain fall pool of 837.5 until December 15. – Maintain normal summer pool elevation of 742 through October 14. – Begin a slow raise starting October 15 so the fall pool of 744.5 is reached by November 1. – Maintain fall pool of 744.5 until December 15. The DNR understands, that due to low flows, the reservoirs may only be able to increase a few hundreds of an inch per day. Due to low flows it may take longer to reach fall goals. Enjoy the trails but please remember to be respectful of private property. The trails are a privilege we do not want to lose. 2/9/2011 We have received a complaint that people are riding on the county walking trail that was just completed from 76th Ave into the new Ely city park. This area is off limits however there are snowmobile tracks on the walking trail and there are signs clearly posted on the gates to the trail that have a snowmobile with a red line through it. If you know of the guilty party please let them know that this is an easy way for us to lose our privileges of riding through Ely. Any help here to prevent this is appreciated. 12/17/2010 Drive slow on the field trails from 965 to Ely. This is chiseled ground and until we get some snow this will be bumpy. The other option is to take the road. 12/14/2010 At Scales Bend Marina/Bobbers please look out for the wave breakers when entering and exiting the lake. The positioning of the docks is a little different this year than last. Please go out the ramp past the breakers and do not ride over them. Bobbers has marked most of wave breakers every 50′ except for the very end. They are waiting until the ice thickens. These will be hard to see until they are marked. Farmers have tiled a lot of fields this year. Stay on the trails to avoid a sudden jump! Watch out going through Western (just north of Shueyville). 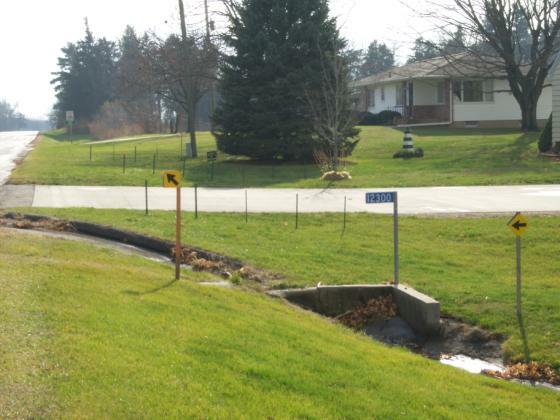 The trail is marked to avoid the culvert. The City of Cedar Rapids did work on 965 heading south toward North Liberty. The construction left several pieces of silt fence. The fences are marked but this entire ditch was filled with snow last year so make a point to look for these markings, some may get buried. Riders should pay close attention. In the long run this is a benefit to the club but for this year, watch out! Note for this year, Please stay on the marked trails. There had been sleds taking a short cut near the Centro factory. See the picture. Stay on the marked trail or stay home. NOTE:We had several complaints about snowmobilers riding where they really shouldn’t be last year. One of those places was the Country Estates to get up off Coralville Lake to Club 76 (the Lodge). This is a Private area. There was no snowmobile trail there and NEVER has been. It doesn’t matter that “you always rode through there” it was still wrong. Stay out of there. 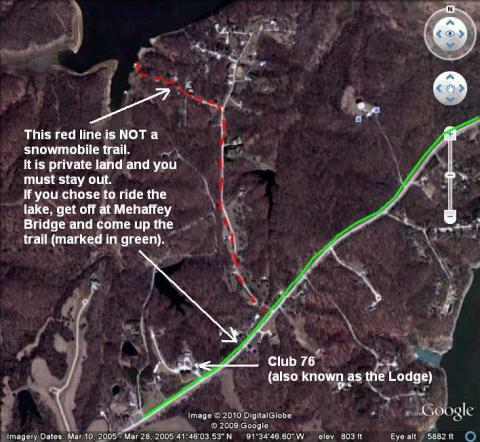 If you are riding on the lake you can get off at Mehaffey Bridge and come up the marked trail. Here is a picture of the area. Thanks go to everyone for helping with this issue. After posting signs to not use this trail the number of snowmobiles cutting through this area has dropped to near zero. Thank you from all of the residents there. NOTE: Another problem was in Solon. Sleds were riding through town from Joensy’s going west to the sports complex. This isstrictly forbidden. 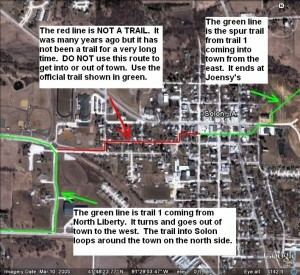 The only trail in and out of Solon is on the east side of town coming in past the Mustang BP station and down the alley to Joensy’s. It goes no further than Joensy’s. Many years ago there was a trail coming out to the west but is has not existed for a very long time. We lost that trail due to the bad actions of sledders so stop using it as if it still exists. It doesn’t. Please see the picture below. Obey the rules and follow the trail markings or STAY HOME. There is lots of trail work done every year by too few people. Perhaps you could contact the club at iowasnowdrifters@gmail.com and volunteer to help. Shueyvile to Mowhawk hill & back was groomed this morning. Thayne is now heading from Shueyville to Ely to Solon & then North Liberty. Thayne groomed today from NL to Tiffin, Oakdale Prison North on 965 to Walford Rd. & then to Shueyville. Tomorrow he’s planning on grooming from Shueyville to Ely back to Sam Stahle’s. Just a reminder to ALL riders,( not just club members )!20th St. is off limits to snowmobiles. Please stay on marked trails & out of peoples yards. This is a place to leave comments about the trails. Note that you must be a club member to do so and will need to register for this site. The first comment will have to be approved and will show after an authorization process. After that your comments will show up after you submit.